While I talk about the details of what makes a good story in another article, we will look at what and why storytelling is important in this article. Storytelling is the art of relating a story. The business world has used storytelling a lot in the context of presenting, writing and communication. True storytelling, though, involves both speaking and the effective use of the body. A very good example of storytelling in the today’s world is acting. When we tell stories to our kids we use our facial expressions and voice to describe scenes of a story. In a very similar way I’ve seen many successful business leaders speak to large and small gatherings using their body and modulating their voice. As product managers, designers and entrepreneurs, we are constantly interacting with people – customers, users, engineers, businessmen and more. Our job is to make sense of something, ingest and relate the learnings to a completely different set of people. For example, we go out on a design research activity, recording conversations, emotions, behaviors and much more. In order to get the relate these observations with the engineers and management, we use storytelling techniques knowingly or unknowingly. 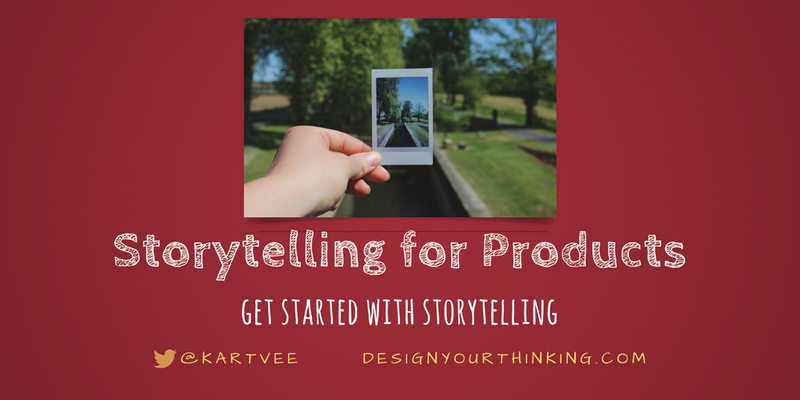 In many companies we see the marketing team communicate and tell one story of the product while the management tells another story to its employees. On the other hand the product manager tells a whole different story of why the product exists and what its purpose is. Many product managers fall into the trap of having to produce a roadmap of features that describes what the product will help customers do. I’ve seen many companies and product managers fall into this trap. Storytelling can play a big role in creating a product that customers love. Simon Sinek in his book Start With A Why, talks about the golden circle and the essence of starting with the why and then explaining the how and the what. Essentially as product managers its our job to tell the story of our product, tell the world why the product exists. If you can use the techniques of storytelling to tell one story of your product that gets communicated clearly across internal functions and customers, you no longer will be asked for a feature roadmap. In fact, you can now start to focus on your how to realize your product’s purpose and then think about features when it gets to what to do. As Product Managers, we do a lot of user interviews and take critical decisions. We are in other words, trying to understand the real story. To get to the bottom of the real story, one will need to use a good framework of questioning or inquiry. In other words, we are looking to understand the why behind the story. You can read more on this in my article Getting To Why. If you enjoyed reading this piece, join DYT Insider below. It’s my newsletter and I’d love to share some of my best content and my ebooks with you. Look forward to hearing from you and seeing you inside!